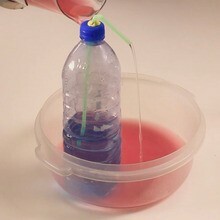 This experiment is very easy to make and will give beautiful and varied results! Find out what phenomenon is involved in this experiment! The phenomenon here is the diffusion. Fick, a German physician of the 19th century, made a law that governs this phenomenon. 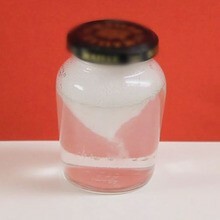 Ink is denser than water, but they are miscibles, which mean they can mix (conversely to oil and water). Ink particles try to move where they are not concentrated yet in the water. 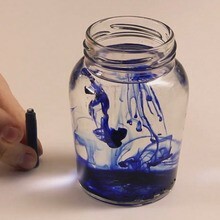 If you leave the jar for a very long time without moving it, you'll see that water and ink will finally mix. Diffusion is very slow here, and you can see another case of diffusion with tea in hot water. Moreover, it is exactly the same phenomenon for a smell that diffuses in a room. Fill a glass, a bowl or a jar of water. It's better if the container is transparent. Wait until the water is still, let a drop of ink fall on the water. You can observe that beautiful curls are slowly forming in the water.